I’ve been spending all my time playing Pokémon Silver on the 3DS, which is still really freakin’ great, and a game I’m not allowed to talk about yet, so I’m going to pull the same trick as last week and talk about an upcoming game I was lucky enough to sample recently. 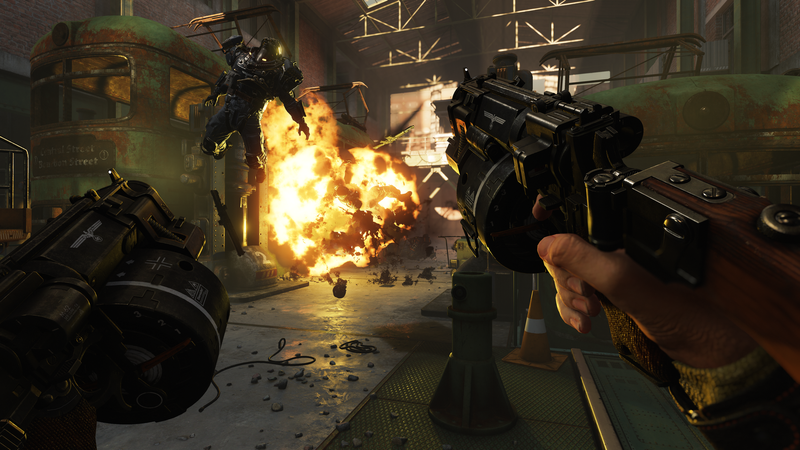 At the same event in which I saw Doom on Switch, I got to play a decent-sized chunk of Wolfenstein II: The New Colossus. This particular demo had me tearing through the streets of a Nazi-infested New Orleans searching for a resistance leader with the deliciously Southern fried name of Horton Boone. Besides being way tougher than I was expecting (fun fact: I’m absolutely terrible at playing games in these weird context-free demo situations), I was struck by the more open-ended nature of the level and game as a whole. The demo gifted us with three special items that give you more options for how you approach encounters—a gadget that augments BJ’s dash and lets him splatter enemies or bust through weak walls, a steampunk girdle that shrinks the bulky dude down and lets him crawl through vents and pipes, a pair of instantly deployed stilts (described to me as “literally stilts”) to help you pop over cover and reach high ledges. You’ll be much further along in the game by the time you’ve unlocked all three, I was told, but with the full complement in hand, it felt almost like the smallest bit of Deus Ex’s flexibility had crept its way into Wolfenstein, and it was a nifty change. I’m a long-time admirer of former PC Gamer editor turned game designer Tom Francis, a guy who’s made an art form out of finding the most insane possible solutions to problems that crop up in popular games. (Here’s a recent write-up he did about trying to pull his team members out of a deadly situation in XCOM 2; needless to say, it involves intentionally blowing up his own extraction point with grenades.) The brilliant thing about Francis’ games—specifically his 2013 stealth-building-rewiring game Gunpoint, and Heat Signature, which came out last week—is that they essentially force you to become as crazy as he is, improvising bizarre strategy after bizarre strategy to keep yourself alive.